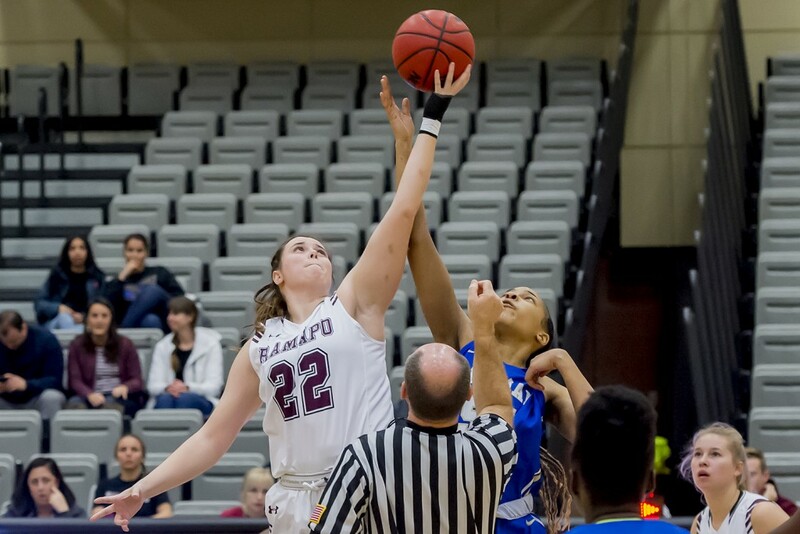 The Ramapo College women’s basketball team fell to the hands of The College of New Jersey, 84-70, in a high-scoring and intensity-driven game on Saturday, Feb. 2. Taking place right on campus in the Bradley Center, the Roadrunners now stand at 9-13 overall and 4-11 in the NJAC conference. 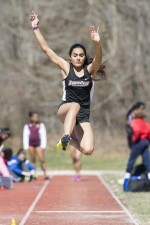 The first points of the game resulted from a good jumper posed by senior Tia Solomon, only 22 seconds after the tip. From there, TCNJ snagged the lead with a three-pointer, leaving Ramapo to trail behind for most of the remaining period. With only 2:33 left on the clock, forward Jenna Harsh was able to tie it up 15-15, with a good layup in the paint. Just under two minutes later, Harsh nailed a three-pointer to regain the lead for the Roadrunners as they headed into the second period leading 18-17. The Lions showed some serious competition in the second period as they held Ramapo at 18 points for first three minutes and 43 seconds. At 6:17, Roadrunner guard Cherie Smedile locked in her first basket of the game- a three-pointer to get the Roadrunners back on track. With points scored from both teams, TCNJ led with 42-28 at the commencement of the first half. For the half, Ramapo hit 11-27 (40.7 percent) field goals and shot 2-3 (66.7 percent) free throws. In the third, the Roadrunners continued to show skill and did not give up. They managed to get back in the game with a 5-0 run starting with two successful free throws from Solomon with 3:11 left on the clock. With momentum growing in the gym, RCNJ ended the third period down by 11 points, with only ten minutes of playing time remaining in the game. The Roadrunners snatched the first basket of the final period with a steal followed by a layup by Smedile in the paint. From there, both teams began to rally, with the biggest deficit coming at 18 at 6:22 when Ramapo fell behind 70-52. Even so, the Roadrunners managed to shrink TCNJ’s lead with a steady offensive performance. With 1:40 left on the clock, the competition transformed into a seven-point game, the score being 74-67. Despite their best efforts to make a comeback, RCNJ fell short and ended up losing by 14 points, for a final score of 84-70. For the second half, the Roadrunners posted 12-28 (42.9 percent) from the field and collected almost all of the free throws they were given, 14-16 (87.5 percent). Junior Jenna Harsh proved to be team leader, tallying a total of 19 points and six rebounds. Following her was junior Samantha Rinaldi who contributed 12 points to the Roadrunners in addition to leading the team with four assists. Other scorers included center Alie Wickersheim and Smedile, each posting 10 points apiece. Wickersheim also collected a team high of seven rebounds, in only 14 minutes on the court. In the end, RCNJ recorded 38 points in the paint and collected 16 points off TCNJ turnovers. The bench recorded a total of 21 points. Although the Roadrunners fell, they did not trail too far behind in field goals, locking in 25-53 (47.2 percent), while the Lions hit 25-56 (44.6 percent). It was the three-pointers and free throws that unfortunately caused RCNJ to slowly slip out of the game. Although the Ramapo College women’s basketball team did rack up 70 points, it wasn’t enough against TCNJ’s final 84. The Roadrunners will return to the court again on Feb. 6, when they travel to Rutgers-Camden to face off against the Scarlet Raptors and hopefully secure a NJAC victory. The tip off for this face-off begins at 6 p.m.